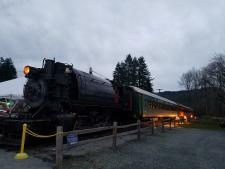 My three-year-old grandson and I recently had the delightful experience of riding on board the Polar Express via the Mount Rainier Railroad. The production was a reenactment of the Warner Brothers animated movie “The Polar Express." The cast were all employees of the Mount Rainier Train Museum. There was much music, dancing, singing, and audience interaction while little children ate cookies and sipped hot chocolate. Somewhere in the midst of it all, traditional Christmas carols were sung. The grand finale was a visit from Old St. Nick who passed out a bell to each child. All in all, it was a very festive excursion. Who would like to live a movie in real life? I know I would and that is what The Polar Express does. It brings "The Polar Express" to a reality we can live and if you have not seen the movie you will want to after enjoying The Polar Express Train Ride. 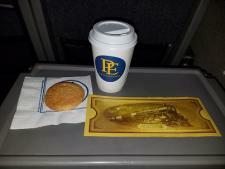 I had the chance to go on the Polar Express Train Ride with my family on the evening of Friday, November 18th. It was a beautiful ride from Federal Way to Elbe as we could see Mt. Rainier covered with snow and my nephew was excited to get on the train. We got to Elbe and boarded the train at 5:45PM. The train ride started with hot chocolate and cookies and follows along with the story of The Polar Express. Santa boarded the train when we reached the North Pole, and people sang Christmas songs. Santa gave gifts to kids: a beautiful silver bell, and the ride ended with Christmas songs and pictures with Santa. All the kids were happy, and the families were happy to see their kids so happy and excited! There was also a Polar Express Gift Shop where you can buy fun gifts for all ages. The Polar Express Train Ride is something that both children and adults can enjoy. When you are ready go on board, sit back and get ready to enjoy the ride with hot chocolate, cookies, music, dancing, The Polar Express Story, Christmas songs and of course, a gift from Santa.